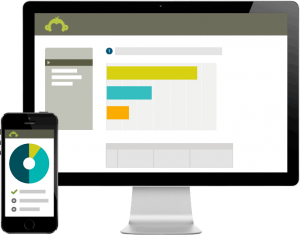 SurveyMonkey is a freemium product and one of the online survey tools that has been around for the longest. Using a free subscription you can produce surveys with up to 10 questions and collect up to 400 hundred responses. This is likely to be enough for the vast majority of student created surveys. It’s pretty easy to use, you just drag and drop the types of question you want to use and then edit the parameters to add the text for the questions and possible answer alternatives. It’s also very easy to export the data you collect from the surveys and analyse the answers. It does look a bit dated though compared to many of the newer survey tools and it doesn’t have very attractive design templates. 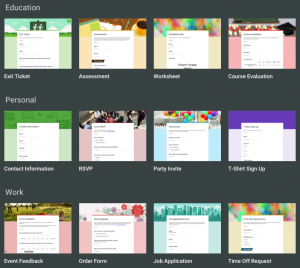 If you are a Google user Google Forms is a great and very simple to use free tool for creating surveys. You can choose a simple template or start from a blank one and choose from a reasonable selection of question types including text input. Google have also made it very simple to integrate video from YouTube and search for and add images. The surveys can be customised quite simply by adding background images and different designs and there doesn’t seem to be any limit to the number of response you can collect. Google Forms are also mobile adaptive so you don’t have to worry if you are working in classes where students use a range of different devices. This is a really powerful survey creator and one of the most user friendly ones I’ve tried. It works on a freemium model which limits the number of templates you can use on a free subscription, but if you are happy with limited design options that won’t be a problem. There is a really wide range of questions types to choose from and you can just drag and drop these onto your survey template. Typeform also offers good support for images and media, so if you want to add videos from YouTube or upload images Typeform would be a good option. This is one of the survey tools I use most often and it’s a great tool for exploring the pros and cons around a particular problem and really pulling in ideas from the survey recipients. You simply add a single question or problem and then users can add ideas for solving the problem. They can also add the pros and cons of each idea and then vote for the ones they like the best. The data the survey produces can be hard to analyse, though the voting part is quite straight forward. It’s a great tool to use in class, because it’s very simple and quick to create the survey and students can exchange surveys easily and get instant results. 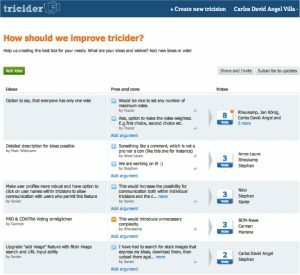 To find out more about how to use Tricider read my article – Crowdsourcing Knowledge with Students. This is a great tool for very simple surveys that just require a simple text input. It’s great for brainstorming words related to [topic] or how do you feel about [topic]. 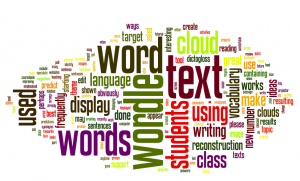 The answers can also be exported to Wordle which creates a colourful word cloud of the answers showing the most popular options at larger sizes. It’s also a great tool for use in the classroom because the site automatically generates a QR code for each survey so students can quickly scan the survey onto their phones and answer immediately. To find out more about how to use AnswerGarden read my article – Brainstorming and polling with AnswerGarden. 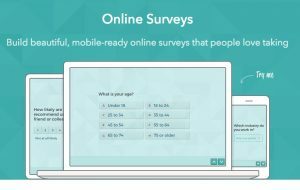 I hope these survey tools are useful. Surveys play a very important role in the development of digital literacy and are an integral part of my 10 Lessons in Digital Literacy book.